Sony Reader is now (finally) running a consumer-oriented TV ad, and the NY Times reported yesterday on the iRex launch. You can bet Amazon will hype Kindle to the max in the coming weeks, along with its promotion of the Kindle 3 large format in the college textbook market. Apple is conspicuously absent, although you can use apps like Stanza to read ebooks on your iPhone. But that's hardly a competitive strategy for Apple. I'm betting they come out with a docking screen for some or all of the iPod models. I decided to join the club and beefed up my membership and presence on ebook distribution service Smashwords.com, which supports open-source EPUB and Sony LRF, as well as lots of the other formats. I'm thinking a big consideration for ebook buyers should be the long-term cost of buying content. Prices of ebooks vary widely, but many Amazon Kindle versions are advertised at just under ten bucks. Lots of Smashwords EPUB versions range from free to a buck or two, although bestsellers typically cost more. Then too, there's the public domain library offered by Project Gutenberg, where everything is both free and about a hundred years old. But if you're looking for Charles Dickens rather than Dan Brown, you can find him and thousands of other famous authors there in EPUB, HTML, and "plain-text" formats. 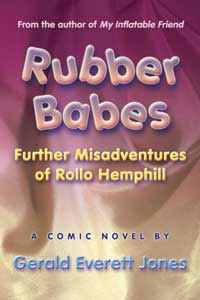 My Inflatable Friend and Rubber Babes, the first two books in the Rollo Hemphill series of comic novels, have been available in Amazon Kindle, Mobipocket (PDA), and Adobe PDF (Ingram) formats since the day they came out in paperback. I'm jumping into the other formats now on Smashwords by offering Rubber Babes for $1.99 in EPUB, Sony LRF, and a variety of other non-DRM versions. Ebook sales (and free downloads) seem to be taking off. For example, I just read today that a healthy percentage, if not a huge one, of The Lost Symbol sales have been ebooks. Perhaps the dominant business models. platforms, and formats in this new marketplace will now emerge, and quite soon. I personally think that ebooks ought to be much cheaper than they are on Amazon($1.99 is about right). It's an entirely different market to hard copies (at least at this stage) and there's very little cost to the publisher - that benefit should be passed on and made use of to generate buzz and a larger audience. If a person likes an ebook, they'll often buy a hard copy for someone else as a gift (I do that often), so there's a good relationship between hard copies and ebooks (just ask Cory Doctorow). I can't see ebook readers that don't allow for multiple formats like txt and above all .pdf, and for multiple purchasing/download sources having much of a future once they become common and inexpensive enough for sales to be driven by desire rather than hype. Maggie I certainly don't disagree about price point, especially when you consider that the typical royalty from a traditional publisher is about $1-2 to the author. Proprietary formats like Kindle could enable the platform maker to strike exclusive distribution deals with authors. Thanks for stopping by! We missed you! What Makes a Story a Movie?